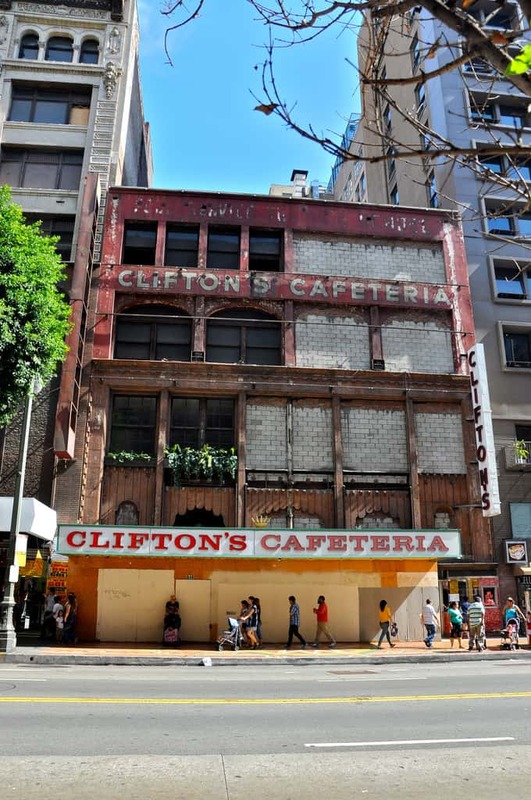 Mod B and Keith V have both been waiting forevs for Clifton's Cafeteria in L.A. to reopen. 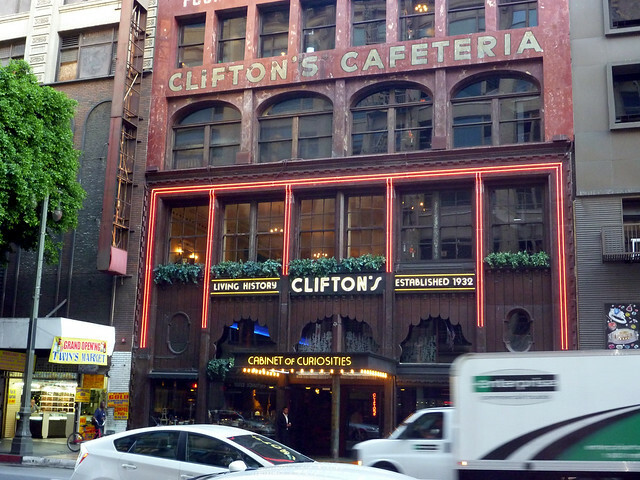 2015 - Clifton's Finally Returns! Anticipation is a heck of a thing. The combination of desire and forced waiting can be a strong elixir. But if too much time passes that desire can quickly wane and turn into distaste. 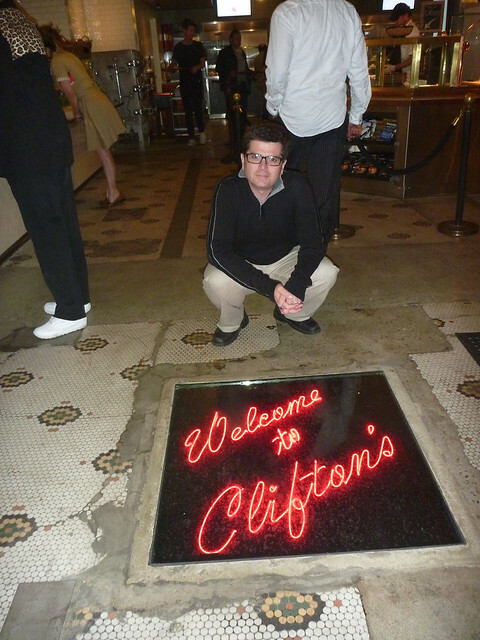 That is how I was starting to feel about the grand re-opening of Clifton's Cafeteria in Downtown Los Angeles. After all I have never in my life waited and wanted anything for four years. Except maybe high school and college graduation, although neither of those events were something I was in a real rush to get to. After several delays, some four years and change since Clifton’s closed their legendary doors for a multi million dollar remodel, I was finally allowed to walk back into the legendary cafeteria. Was it worth the wait? In some ways-- Yes!! In others? Sadly, no. Visually, the place is stunning - though my photos don't quite do it justice. 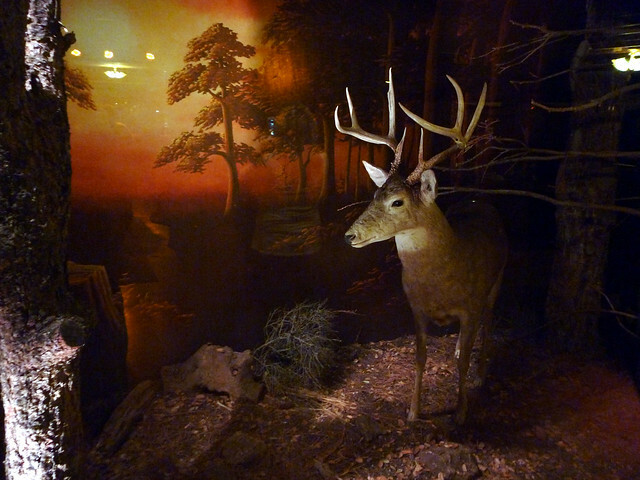 Lovingly restored to resembled a lush forest complete with wildlife (taxidermy versions) and lots of carved wood and stone. The legendary fountain flowed and bubbled with joy again as diners from all walks of life ate nearby. We explored Clifton's nooks and crannies and found several hidden treasures in the form of animals, left over features, and amazing carved wood and stone work. 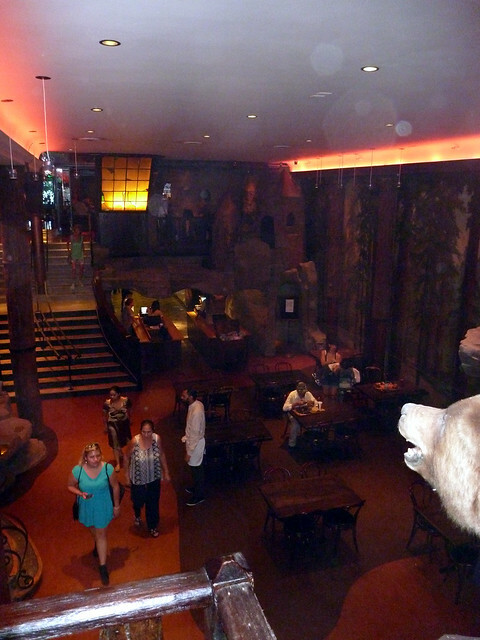 The second floor is beyond belief with a giant redwood like tree as the center attraction. 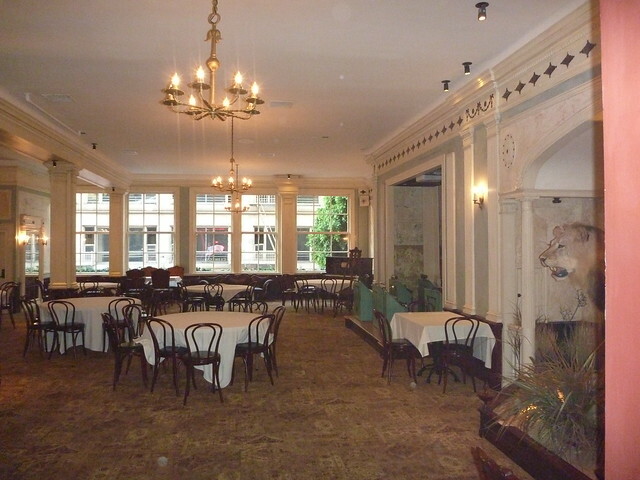 To the left of it is a bar.  The right, a real buffalo under glass. Several hand carved chairs and thrones make it an inviting lodge like place to sit and hang out. 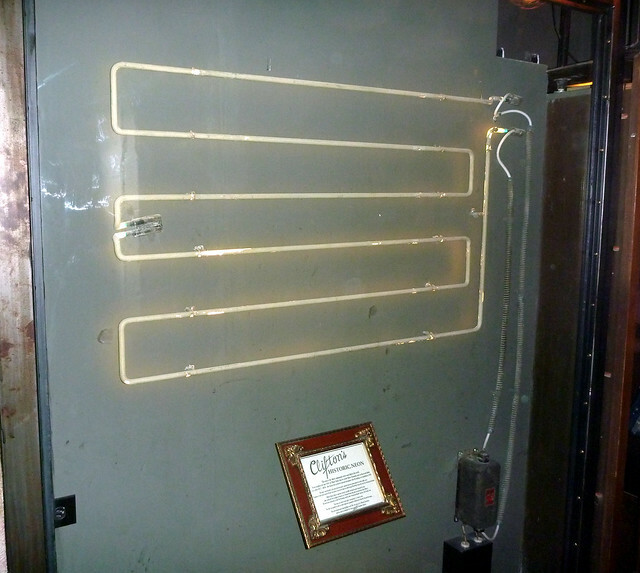 The other highlights for me were both the “Oldest Living Neon” in the basement by the vintage phone booth and the lavish third floor. Now on to the food which was served by some of the friendliest people I've ever met in downtown. Perhaps anywhere. 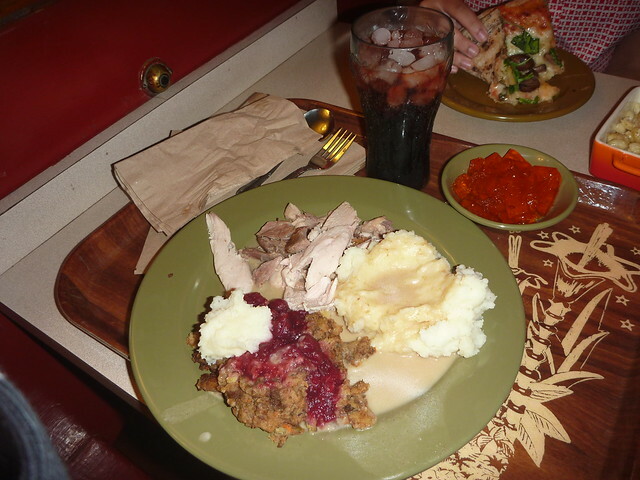 For a mere $18.00 we got the “Thanksgiving Dinner” (complete with mashed potatoes, stuffing, cranberry sauce and gravy) a slice of veggie pizza, 2 cokes and 2 jellos. The jello is just 35 cents and will remain so for at least the next couple of months. Was it the best I've ever had? No. It was just okay. But this is a cafeteria for goodness sakes. And to be honest I can't recall how the eats were when I last dined here all those years ago. They offer a lot of different food stations (including salad, sandwich and desert) so there will be plenty of other tings to try the next time around. Maybe the fried chicken? My teenage daughter remarked, “This place is like a Disneyland Restaurant. Very Theme Parky.” I had to explain to her that before Disney there was Clifton’s. A magical enchanted place full of whimsy and fun since 1939. But as I settled into our ancient booth I thought about what she said. Forced old school ambiance was everywhere. The blaring big band music was a bit much. 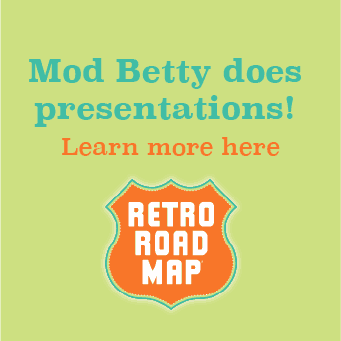 It screamed “See We're Old-Timey! 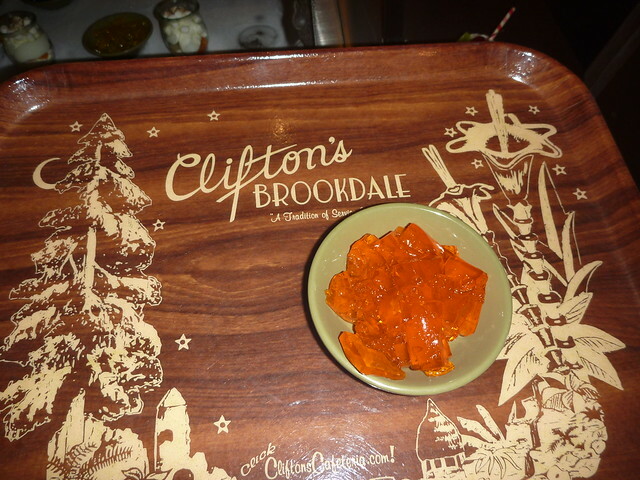 Really!” By trying to seem too authentic, something about the new Clifton's seemed, well, fake. A lot like Disney. I will return to this fabricated woodland wonderland next time I have out of towners visiting and looking to see something special. 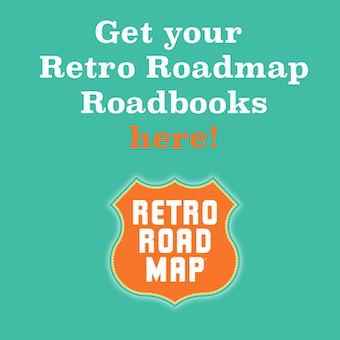 It's retro golden. But eat there? I think maybe a whole tray of 35 cent jellos for my friends in order to just sit there and soak it all in.